Why must space have that? Because you say so? Well, if you want to make your point, you have to provide the calculus. Otherwise, all of the above is just word salad. Face it, Bjarne: Nobody will take your word for any of it. You have to SHOW your calculations. It is indeed time for you to wake up to that fact. Everyone can make a easy rough calculation, and easy conclude that this theory and the forces in play , is matching the bill, MTR is fully suitable to explain the Oumuamua mystery, in all details. Its not necessary to compute a Oumuamua orbit etc. right now.. This mystery is so strange, - because of the illusion that ONLY Oumuamua is affected and obviously nothing else in the Universe. It was excactly the same kind problem we was facing when discovering the Flyby anomalies and the Piooner anomalies. WHY was the earth or other objects not effected was all scientist asking each other. Remember now the internet is full of ideas claiming that it MUST be aliens that is controlling Oumuamua, such statements is not what you only will hear near pubs late weekend nights, - but now from respected scientist. WHY - because this mystery is really STRANGE... and because we have NOTHING, - nothing at all, excepts aliens, to prevent our paradigm, - and then me of course. There are serveral mysteries connected with Oumuamua , - The MTR solves all. If scientist had read and respected the theory before, they should have seen this coming. And you know what, - there could very well be many Oumuamua out there, following completely stange orbits, similar to Oumuamua ..
Hans we have discusses strange orbit for years now, - how long can you resists down to earth logic ? That's some nerve using the bolded word in this thread. Your whole premise went TU quite a ways back. It's amazing how arbitrary units like meters and seconds end up fitting so perfectly into an equation like that. Just see is as 2 forces counteracting each other (more or less, most of the time) , - the deceleration issue is really not relevant, because it will not take place . Can you provide one example of a respected scientist who said it MUST be aliens? You have no logic. Just claims you can't support. where 3.28083989501312335958005249343832020997375... abbreviates that sequence of digits (including the leading 3) repeated infinitely. By international agreement, 1 foot is exactly 0.3048 meters, so 1 meter is exactly 1/(.3048) = 1250/381 feet, and the rational number 1250/381 is exactly equal to that repeating decimal. So Bjarne is telling us 1250/381 is a fundamental constant of the universe, just like 374740572500/381 (which is 299792458 divided by 0.3048). Bjarne: Did you obtain your constant 3.28083989501312335958005249343832020997375... via measurement? Or was it a seat-of-your-pants calculation? More of the same nonsense from Bjarne. 9 January 2019 Bjarne: A delusion that the valid explanation of the Pioneer anomaly is related to 'Oumuamua. Now HARVARD claims that aliens was controlling Oumuamua in and out of our solar system. 9 January 2019 Bjarne: Ignorance about the source of and 'Oumuamua solar sail speculation. Harvard is a university which is irrelevant. The 2 authors of Could Solar Radiation Pressure Explain 'Oumuamua's Peculiar Acceleration? work at the Harvard Smithsonian Center for Astrophysics which is irrelevant. Their 'Oumuamua solar sail idea is an uncontrolled solar sail that is debris from an alien spacecraft travelling between planets in another solar system. Their more exotic scenario is an "unmanned", not controlled by aliens, probe sent here intentionally. 7 January 2019 Bjarne: Usual delusion that merely repeating your delusions makes them correct. 7 January 2019 Bjarne: ʻOumuamua insanity and ignorance. 7 January 2019 Bjarne: An insane "0,01 ns SR anomaly" question and lie when he is ignorant about the orbits of Galileo 5 & 6 and cannot make a prediction. 7 January 2019 Bjarne: Basically lies about the 'Oumuamua is a solar sail speculation. 7 January 2019 Bjarne: A "many other scientist disagree" lie about the origin of 'Oumuamua. 7 January 2019 Bjarne: "Oumuamua strange acceleration simply just is caused by EDFA" delusions and a graphic from his web site on the trajectory of 'Oumuamua. Last edited by Reality Check; 9th January 2019 at 05:10 PM. 9 January 2019 Bjarne: Lies again that his delusions explain the pioneer anomaly. Last edited by Reality Check; 9th January 2019 at 05:18 PM. ....This is EXCACTLY, - 100% EXACTLY what MTR predict. 9 January 2019 Bjarne: Usual gibberish and then a deep "EXACTLY what MTR predict" delusion. A rational physical prediction for the effects of whatever caused or is causing a debated dark flow of galaxies billion of light years away would be nothing! All the forces in physics have an inverse square or worse law. High school students know F = GmM/r^2 and what it means as distances increase . A rational scientific post from Bjarne would be to plug the force needed for the acceleration of 'Oumuamua and say Earth's mass (way too big but we do not know 'Oumuamua's mass) into F = GmM/r^2. That will give a mass needed to explain the trajectory. Now use that mass to see what happens to the galaxies in dark flow. 9 January 2019 Bjarne: 10? years of this insanely wrong equation! Units of measures are not included in scientific equations for the simple reason that multiple units of measure exist. The equation is physically insane because particle accelerators such as the Large Hadron Collider exist. Bjarne has been predicting for at least a decade that they cannot work ! Last edited by Reality Check; 9th January 2019 at 05:40 PM. 9 January 2019 Bjarne: A spate of his usual gibberish ends in a stupid delusion of 'Oumuamua returning. 'Oumuamua will not return according to textbook physics. 'Oumuamua will not return even with Bjarne's delusions as shown by the graph from his crank web site. He should try to understand what he posts. 'Oumuamua has a trajectory that is away from the Solar System in the "east" direction. His delusions accelerate 'Oumuamua to the "south" and as he writes "the trajectory is gradually forced horizontal". 'Oumuamua will always have a velocity component outward from the Solar System. Gibberish, a lie and abysmal ignorance about 'Oumuamua. 9 January 2019 Bjarne: Gibberish, a lie and abysmal ignorance about 'Oumuamua. 'Oumuamua is not in an orbit. 'Oumuamua has a strongly hyperbolic trajectory showing that it is not bound to the Sun and is leaving the Solar System. A lie because if his MTR delusion "is fully suitable to explain the Oumuamua mystery, in all details" then where are the details . That need not be his fantasy of matching the strongly hyperbolic trajectory of 'Oumuamua. The signs are that he is too ignorant to do that. All he has to do apply his MTR delusion to give a number for the acceleration. How lucky we are to have you. It's not exactly your hat I think you're pulling all this out of. This foolish chart that you have presented numerous times never did make sense to me from the start because I could tell it was in error. Good point, Crossbow. I have been charitably assuming for the last decade or so that the graph was mislabeled and ignored it. But Bjarne's reply to you implies that he has no idea what his insanely invalid equation produces - what a surprise . 9 January 2019 Bjarne: v^2/c^2 is < 1 for v < c so what is 1 - v^2/c^2? The square root? The reciprocal? 1 - that? 1 - v^2/c^2 is a number less than 1. The square root of a number less than 1 is a number less than 1. The reciprocal of a number less than 1 is a number greater than 1. 1 minus a number greater than 1 is a number less than zero. We call that a negative number. 9 January 2019 Bjarne: Explain how an equation producing negative values is plotted as positive values in a graph? P.S. Bjarne: Check your spelling: Relativistic. Last edited by Reality Check; 9th January 2019 at 06:25 PM. 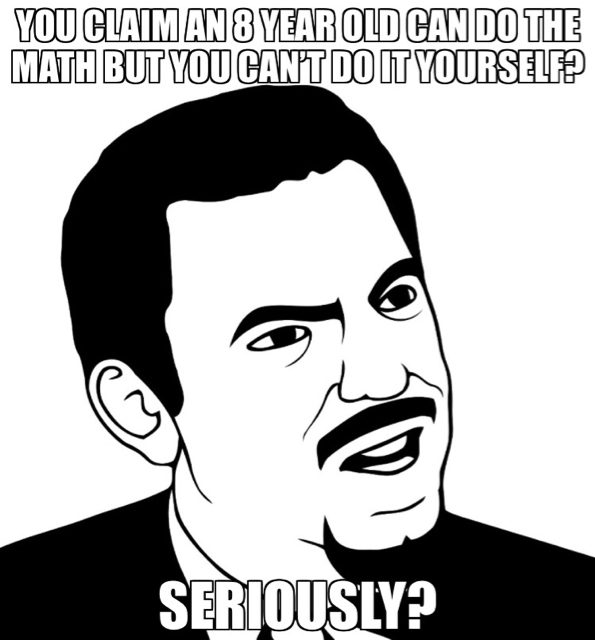 He claims an 8 year old can do the math to apply his ideas but he can’t do it himself. In this regards RR and DFA represent 2 different forces counteracting each other. You can show this just like 2 oppesite forces. The the deceleration never happen, - deceleration is only a potentiel possibility. You just need a little exstra force to reach the speed you want. Agian no deceleration will happen. So now tell us all WHAT on earth does speed of an object have to do with the time dilation. The fact that you dont understand anything of that process of what is going on, does not mean such equation is wrong. [b] 'Oumuamua to the "south" and as he writes "the trajectory is gradually forced horizontal". 'Oumuamua will always have a velocity component outward from the Solar System. The orbit of Oumuamua will never be flattened completely south, - the orbit is just very temporary pulled south, - the relative remarkabel strong mysterious force south (EDFA) is rapidly decreasing, - as I say this is kinder garden math to figure out. - The force of the sun is much strong a, so Oumuamua will go in orbit, and one day fall down from north agian. However the next you will hear from the most respected University is that there must me aliens on board on Oumuamua and now they suddenly got a huge problems with the master solar sail. And the next that happens is that all antennas on earth will try to cath mayday signal from Oumuamua ..
Last edited by Bjarne; 10th January 2019 at 03:22 AM. So stop making worthless assertions and mathematically show that you know what are talking about. I tried to do some rough calculation today and saw I have overlooked one very important aspect that also belong to this discussion. The image and text below is a 3 years old copy / paste. I am mentioned this just to insure you all that I do not need to invent new principles all the time we have new astrophysics problems or challenges, - the MTR theory is indeed complete, and invincible. RR is a reversible process. This means that if no force pushes / pulls an object (further) towards the RR direction (see principle 4), the object will decelerate. The RR affecting an object can be compared to a retracted arrow. All that is required for the retracted, potential, kinetic energy of the arrow to be released is that the force of the string is released (which also illustrates that motion opposite DFD will cause less RR, also simple to calculate based on the Lorentz equation). The point here is: that the Sun was pulling Oumuamua downwards towards the Dark Flow direction during hundred of years, - Due to the downwards pull/ force of the Sun Oumuamua was increasing its absolutte speed, - and hence much stronger effected by RR as for example, the Sun or the orbiting planets. Right after Oumuamua was reaching perihelion, and begun to change motion direction (north) (oppesite Dark Flow) - the absolute motion speed of Oumuamua was dramatical reduced and hence Release of Retracted Potential Kinetic Energy (in short RRPKE) begun to happen. A large part of the upwards acceleration is therefore originated from the force of the Sun, - So we have serveral forces in play here. And some effecting Oumuamua from different directions..
Last edited by Bjarne; 10th January 2019 at 10:12 AM. You have a vivid imagination. Have you ever considered writing science fiction and publishing it as such? It would likely get you more attention and readers than your half-arsed efforts at overturning established science. Well that’s a defeatist attitude if I ever saw one. Of course, you are the guy who insists you can unseat General Relativity with a bunch of bluster and claims that an 8 year old can do the math, all while being unable to do the math yourself, so a defeatist attitude is not unexpected. You’ve shown yourself very good at the bragging, but incapable of the doing. Irrelevant gibberish. Or is this ignorance of high school level arithmetic? Last edited by Reality Check; 10th January 2019 at 04:02 PM. This is an insane statement because a child could plug in the speed of particles in accelerators such as the LHC into his RR "equation" . 1 - 7071 = -7070 with Bjarne's random units of m/s^2. Bjarne's RR equation gives a deceleration of -7070 of m/s^2 of LHC particles ! Now look at your graph, Bjarne, which has microgal with a "RR" going up to 200 microgal which is 0.0000002 m/s^2. It would be insane to state that that this "RR" has observable effects when an RR a billion times stronger has no effects. The obvious way to remove the insanity is to state that even an RR of a billion microgal has no measurable effects. A further point is the particle accelerators have magnets that are tuned to accelerate particles when they arrive. If they do not arrive on time at the correct volume in the magnet then they are lost to the system. The fact that particle accelerators work and especially that the LHC works shows that only the textbook physics is operating. 11 January 2018 Bjarne: A completely ignorant and rather deluded question about time dilation (my post was about units and acceleration). The orbit of Oumuamua will never be flattened completely south,... ..
10 January 2019 Bjarne: A spate of his usual gibberish ends in a stupid delusion of 'Oumuamua returning. This is the high school physics that an acceleration in one direction ("south") does not change the orthogonal velocity ("east"). Thus 'Oumuamua will always have a velocity component outward from the Solar System. 11 January 2019 Bjarne: Abysmal ignorance about 'Oumuamua is becoming insane ignorance ('Oumuamua was not, is not and never will be in orbit around the Sun). This is 'Oumuamua which has a strongly hyperbolic trajectory. In astrodynamics or celestial mechanics, a hyperbolic trajectory is the trajectory of any object around a central body with more than enough speed to escape the central object's gravitational pull. 'Oumuamua has a strongly hyperbolic trajectory and will escape from the Sun. as I say this is kinder garden math to figure out. - . 11 January 2019 Bjarne: Idiocy of a "kinder garden math to figure out" post with no math at all ! Bjarne is implying that Bjarne cannot do kindergarten math. Recent evidence is that Bjarne cannot do quite basic math (multiplication, division, subtraction, square root). 11 January 2019 Bjarne: Complete and invincible idiocy about his delusions. Adding to what we already know is ignorant delusions is idiotic. Forgetting about that addition for 3 years is idiotic. A stupid archer cartoon with no explanation is idiotic. No physics or math is idiotic. Ignorant fantasies about 'Oumuamua are idiotic. 11 January 2019 Bjarne: A stupid lie that science is science fiction or comparable to his ignorant delusions. These professionals did valid physics and actual mathematics using real world observations of 'Oumuamua. Their rational scientific result was that if solar radiation pressure caused the acceleration of 'Oumuamua then 'Oumuamua is thin spread out body. Their rational scientific conclusion was that that was a strange but viable shape for a natural interstellar object. Their rational scientific speculation was that it could be a discarded solar sail that originated from another system. Another rational scientific speculation was that it was an alien probe. My dear, after 7 years here at the thread and 17 years at a University, you still misunderstood the fact that; so long there is a resulting force acting on the particle the speed of the particle will correspond to the force. If a deceleration should take place the force of RR MUST be stronger as the force the LCH exert on the particle. The fact that this is not the case, due to the fact that the RR force is comparable ridiculous low force, the result is that the speed of the LHC particles will just be ridiculous lower as expected. This is about Newtons second low, - its about the resulting force. Its something 10 years old schoolboys long ago have understood. - Why not you ? Last edited by Bjarne; 10th January 2019 at 11:42 PM. In this context there is no deceleration, but rather 2 forces. Furthermore its seems that you dont understand that from one perspective an object can be decelerating from another perspective the same object is accelerating. Last edited by Bjarne; 10th January 2019 at 11:43 PM. Forces are vectors, of course they can be negative. Otherwise, what exactly is the difference between acceleration and deceleration? Also, it's a bit rich of you to complain that negative values are nonsense when it's your equation that's producing the negative values. Last edited by wollery; 11th January 2019 at 03:13 AM. Last edited by wollery; 11th January 2019 at 03:10 AM. So you think they allready now can discover a 0,01 ns SR anomaly ? It's 2019, Bjarne. Just admit that you were wrong. Last edited by Bjarne; 11th January 2019 at 11:09 AM.